Amazon released its newest media streaming device, the Amazon Fire TV with 4K Ultra HD in October of 2017. 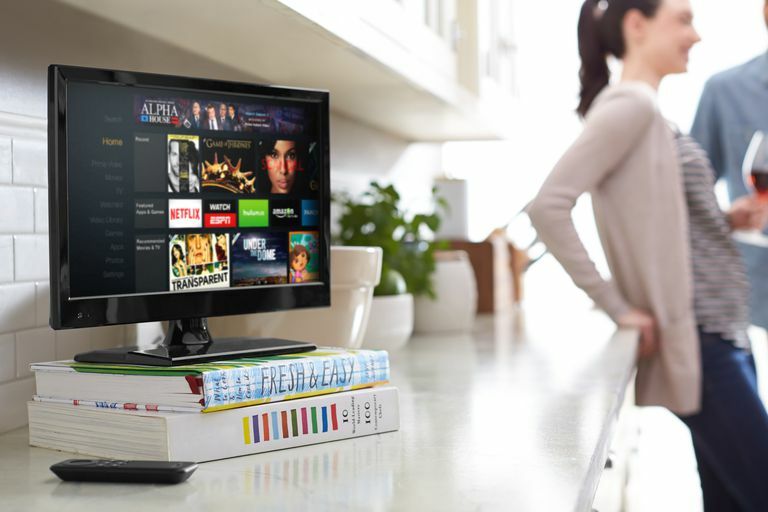 There were predecessors to this device, including two previous generations of both the Fire TV and the Amazon Fire Stick. This device improves on those in many ways, most notably in the areas of streaming video quality, number of available apps, and viewing options. To set it up, follow the instructions below. Amazon Fire TV comes with three pieces you need to connect. There’s a USB cable, the square (or diamond-shaped) Fire TV device, and a power adapter. They only connect one way, and there are directions in the box. The USB cable is positioned in the middle though, and connects the power adapter to the Fire TV, if those directions aren’t clear. Plug the power adapter into a nearby outlet or power strip. Run the USB cable behind your television and connect the Fire TV to an available HDMI port on it. Use the Source button on your TV’s remote control to locate the HDMI signal for the Fire TV. Note: If all your television’s HDMI ports are in use, remove one of your existing devices to make space for your new media streamer. If you have devices that are both USB and HDMI compatible, those can be moved to an open USB port. If not, a USB to HDMI converter might work for DVD players and similar devices. Connect your Fire Stick directly to your TV. Microphone button: Tap this to engage Alexa on your TV. Give a vocal command stating what you’d like to do, watch, or access. You could say, for instance, “Show me Prime Movies” or “Play the game Sonic the Hedgehog”. O-Ring: Position your finger on the outside of the O-ring, on the top, left, bottom, and right, and click in the direction you’d like to move to on the screen. You’ll see items highlighted as you move around. Tap inside the ring to apply the highlighted selection. This can start a movie you’ve selected or open an app that you’ve browsed to, among other things. Back button: Tap to go to the previous screen in the Fire TV interface. Home button: Tap to go to the Fire TV’s start page, which displays available media, apps, games, and so on. Options button: Tap this button (the one with three lines) to access options, which may or may not be available based on what is currently selected. Rewind, Play, and Pause: Tap and tap or hold as applicable to move through currently playing media. Note that this might not work on all apps or with all video services. You can also control the Fire TV with the Amazon Fire TV Remote app. Look for it in your phone’s app store. When you see this screen, click the Play button on the remote to begin the setup process. When prompted, press the Play button on the Alexa Voice Remote. Use the remote to complete the rest of the steps here. Select your Wi-Fi network; if more than one exists choose the fastest one. Input your Wi-Fi password and click Connect. Wait while the software updates and the Fire TV stick initializes. This could take 3-5 minutes. When prompted, accept the default registration information (or you can opt to use a different Amazon account). Choose Yes to let Amazon save your Wi-Fi password. Choose Yes or No to set up parental controls. If you choose Yes, create a Pin as prompted. Watch the introductory video. It’s very short. Click Choose Apps and select the apps you want to use. Use the right-facing arrow to see more. When you’re finished, click the Play button on the remote control. Wait while Amazon finishes the setup process. Change Fire TV settings from the Settings options. The Amazon Fire TV interface is separated into sections that run across the top of the screen. These sections let you access movies, videos, settings, and so on. You use the Amazon Fire remote to navigate through these sections to see what type of media is available to you. If you downloaded the Hulu app during setup for instance, you’ll see Hulu as an option. If you pay for Showtime or HBO through Amazon, you’ll have access to those as well. There are also games, Amazon Prime movies, access to your personal Amazon library, the photos you keep on Amazon, and more. Explore Help first. You can watch videos on almost everything the Amazon TV stick offers including but not limited to how to set up Amazon Fire TV, how to stream media, how to manage the Fire TV apps list, how to use the Amazon app, and how to use the Fire stick channels and more.